Here is a very short discussion of what to see in the night sky and how to find it (with a couple of extra notes for the areas of Dallas and the Rio Grande Valley in Texas!). While there may not be many details here, you will find suggestions for places to go for those details. Stars--The stars are basically fixed in the sky relative to each other. During the night the starry sky appears to spin overhead as the Earth rotates beneath it, and the portion of the sky that is visible changes over the course of a year. (This is why constellations stay the same, but which ones are visible are not always the same ones.) Web sites that will give you an overview of the visible sky include Astronomy--Learn What's Up [http://www.learnwhatsup.com/astro/] and Sky at a Glance [http://skyandtelescope.com/observing/ataglance/]. Software is available that will give you a more detailed view. For starters, John Walker has produced a marvelous screen saver as shareware that will show you the constellations currently overhead at your location--go to Sky Screen Saver [http://www.fourmilab.ch/skyscrsv/] for the free download. Commercial software will give you even more features. On clear, dark nights far from city lights you may see the Milky Way, a faint band of light spanning the sky. You are viewing our disk-shaped galaxy of stars from a point within the disk. All the stars you can see with the unaided eye are stars within our galaxy; only three galaxies beyond our own are visible unaided. (An exception would be a supernova or exploding star, such as one in 1987 in a nearby galaxy that was visible for weeks from the southern hemisphere.) With binoculars or small telescopes you can see star clusters, nebulae, and more galaxies. 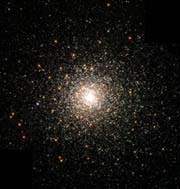 Globular cluster M80 (NGC 6093), taken by the Hubble Space Telescope in 2000 (credit: Hubble Heritage Team (AURA/STScI/NASA)). The Moon--Do you consider the Moon ordinary? Some less ordinary things to notice: About twice a year there is a lunar eclipse (which is the Moon passing through the Earth's shadow), and half the time we're on the right side of the Earth to see it. 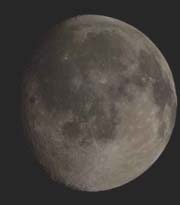 When the Moon is a crescent, can you see the shape of the dark part of the Moon? If so, you are seeing the part of the Moon unlit by the Sun but dimly lit by reflected sunlight from the Earth. Binoculars are enough to show details on the Moon. Near side of the Moon, taken by Galileo in 1992 (credit: NASA/USGS). Planets--most nights at least one planet is visible. Jupiter and Venus, when visible, are brighter than any stars; Saturn and Mars are comparable to brighter stars. Mercury is hard to catch--if it is up, it is following the Sun after sunset or just ahead of the Sun at sunrise. To find out which planets are visible and where to find them, consult one of these sites: Skywatching Center [http://www.earthsky.org/skywatching/], StarDate Online [http://stardate.org/nightsky/planets/], and Astronomy Today [http://www.astronomytoday.com/skyguide.html]--among others (some of the star chart web sites will indicate positions of planets). If you have a small telescope, the planets become truly exciting. The phases of Venus and Mercury are visible, as is the disk of Mars. On Jupiter you can see cloud bands in its atmosphere as well as its four largest moons (Io, Europa, Ganymede, and Callisto). Saturn's rings are obvious (except for those times when they are seen edge on). Uranus and Neptune can be seen with binoculars or a small telescope, if you know where to look. 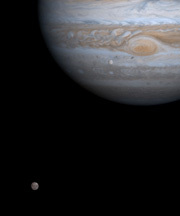 Jupiter with two moons, Europa in front of Jupiter and Ganymede at lower left, taken by Cassini in 2000 (credit: NASA/JPL/Univ. of Arizona). Man-made Earth satellites--of the thousands of man-made objects orbiting the Earth, some are large enough and low enough to be seen with the unaided eye. These can be seen because they are reflecting sunlight. They are generally visible shortly after sunset or before sunrise. (During the day, the sky is too bright; in the middle of the night, the satellites low enough to be close to you are in the Earth's shadow--no sunlight to reflect.) The satellites typically visible are a few hundred kilometers above the Earth's surface and circle the Earth once every 1 1/2 to 2 hours. They may include satellites for communications, for research, for viewing the Earth's surface, spent rockets used to launch satellites, and manned spacecraft or space stations. Whether and where you can see a given satellite is determined by the satellite's path as well as your specific location. Heavens Above [http://www.heavens-above.com] is one web site that will give satellite viewing predictions once you specify where you are. You can select your city from its database, or you can input your latitude and longitude. (Click here for a table of coordinates for cities in the Rio Grande Valley.) Other web sites that give predictions include Visual Satellite Observer's Home Page [http://www.satobs.org/satintro.html] and NASA Sky Watch [http://spaceflight.nasa.gov/realdata/sightings/]. A note on one specific set of satellites: Several of these sites give predictions for seeing "Iridium flares." The Iridium satellites are communications satellites with shiny dish antennas which can give flashes of reflected sunlight. If you're in the right place, the flash of light--lasting just a few seconds--will be brighter than Venus. Predicting what you can see is very dependent on your location--just a few kilometers makes a noticable difference. Hubble Space Telescope in Earth orbit, taken from STS-103 in 2000 (credit: STS-103/STScI/ESA/NASA). Meteors--these are (generally) pebble-sized rocks falling from space into the Earth's atmosphere at speeds of 10 kilometers per second or more. The heat that results vaporizes the rocks within seconds, producing the flash that we see as a "falling star" from the ground. If weather and seeing are good, an average of several per hour are visible. Meteor showers occur several times a year, each lasting one to a few nights. These occur as the Earth passes through the debris trails of various comets. For information on meteor showers, check Comets & Meteor Showers [http://meteorshowersonline.com/] and Spacewatch [http://www.space.com/spacewatch/space_weather.html] (as well as some of the previously mentioned sites). Generally, meteor viewing is better after midnight than before (because at that time you are on the leading side of the Earth as it moves around the Sun). A much more rare event is an extremely bright meteor called a fireball or bolide. These larger objects may be seen to break up, leave trails, or explode. They may also produce sonic booms. Occasionally, pieces of rock from these meteors may survive all the way to the ground and fall as a meteorite. Meteors in the 1998 Leonid meteor shower (credit: Juraj Toth of Comenius U., Bratislava, Modra Observatory). Aurorae--Near the north and south poles, these colorful shimmering curtains of light are familiar sights to residents. Electrically charged fragments of atoms streaming from the Sun are caught in the Earth's magnetic field, spiraling down to Earth over the north and south magnetic poles. When they strike the atmosphere at high speeds, they produce a glow in the air. This is the Northern Lights (Aurora Borealis) and the Southern Lights (Aurora Australis). During intense periods of the Sun's 12-year activity cycle, aurorae become more intense and are occasionally seen much further from the poles than normal. To check for predictions of auroral activity, see Space Weather [http://www.spaceweather.com/]. Aurora seen from a Shuttle Orbiter in space, taken by STS-68 in 1994 (credit: STS-68 crew/NASA). Comets--On average, every few years a comet is easily visible. When this happens, they are visible for a few weeks to (sometimes) a few months. A comet visible to the unaided eye will be in the news (as was Halley's Comet in 1986, Comet Hyakutake in 1996, Comet Hale-Bopp in 1997, and Comet McNaught in 2007). If you want a head start, or if you have binoculars or a telescope to see the more frequent dimmer comets, go a site such as the following: Sky at a Glance [http://skyandtelescope.com/observing/ataglance/]. Comet Kohoutek, taken in 1974 (credit: NASA). Weather--Obviously, clouds and star-gazing don't mix! Some places tend to have good star-gazing weather (astronomers find places like that to build observatories). Pay attention to the weather forecasts in your planning. On the web, you can check the National Weather Service [http://www.nws.noaa.gov/] and the Weather Channel [http://www.weather.com/]. Even without clouds, a concern is haze: moisture and dust in the air reduce visibility. Especially near the horizon, visibility can be poor. City lights and other lights--Given equally clear skies, someone in the country far from any artificial lights can see stars perhaps ten to thirty times dimmer than the dimmest ones visible to a star-gazer in the city. A large city's lights will affect your sky watching even 50 km away. If you can't get away from the city, try finding a safe place with fewer lights around. Artificial lights will affect your ability to see: streetlights, car headlights, even flashlights all prevent your eyes from being adjusted to see dim objects like stars. Get rid of all these and it still takes minutes for your eyes to adjust to their best night viewing. If you need a flashlight to find your way or read a star chart, try completely covering the light with red translucent plastic or cellophane. Red light (instead of white light) interferes much less with your night vision. Safety first--Important! In the process of finding a place for your sky-watching, make sure you are in a safe place. Don't use roadways where you could be hit by traffic (remember, while you're staring at the sky, night is when you're hardest to see and when drivers may be the least alert). Also, in finding a place away from artificial lights make sure you are not putting yourself at risk of attack. Don't be in an isolated area unless it is safe from crime, and do your sky watching with other people. Kids, make sure your parents are involved in your star-gazing--get their help in finding a safe place to observe from. In some locations (including Rio Grande Valley and the Dallas area), many dark isolated places may be dangerous at night--even for groups. Unless you specifically know an isolated place to be secure, stay in secure populated areas. Use the same common sense you would use when you're otherwise out at night (and if you're not using common sense then either, please start!). Also, dress appropriately--be prepared as needed for cold weather, insects, etc. A little forethought will help ensure that your viewing time will be enjoyable! There are astronomy clubs open to the public in many areas that are excellent places to meet other star gazers, learn the basics, even to get advice on what to look for in a telescope. In the Dallas area, check the Texas Astronomical Society of Dallas [http://www.texasastro.org/]. In Brownsville, Texas, the South Texas Astronomical Society meets monthly at the Brownsville Public Library. © 2001-2006, 2007 by Wm. Robert Johnston. Last updated 14 March 2007.